Lombok is a part of Indonesian archipelago, which is located in West Nusa Tenggara (NTB), the capital city of Mataram. Lombok consists of 4 districts they are West Lombok, Central Lombok, East Lombok and North Lombok. 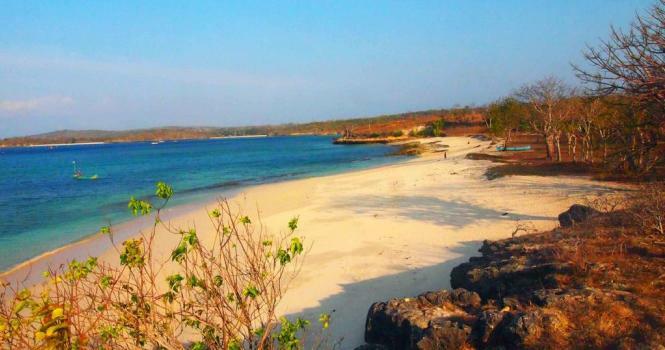 Lombok island itself is surrounded by small islands locally called Gili. Lombok consists of upland forest that is largely undeveloped, while the low-lying island of Lombok has been cultivated, it can be seen from the different types of plants such as rice planting, soybeans, coffee, tobacco, cotton, cinnamon, cacao, cloves, cassava, corn, coconuts, copra, vanilla and so on. Based on culturally and linguistically there is a close relationship between Sasak (Lombok) population with the Balinese, but unlike Bali's majority population, the majority population of this island was Muslim, Lombok also known as the island of a thousand mosques, Islamic traditions and holidays influence the daily activities on this island. Lombok was very famous for the tourism area which is an important source of income on the island, Senggigi was very well known as the city center of tourism activities. Senggigi located in the western part of Lombok and the beaches around Senggigi area were very attractive to attract the tourists to visit Lombok Island. The main tourist area extends to Tanjung in the northwest at the foot of Mount Rinjani and includes Sire and Medana Peninsulas and the highly popular Gili Islands immediately lying off shore. The third small island called Gili, usually can be accessed by boat from Pemenang ward, it just little bit to the south of Teluk Nare, or farther pours in Senggigi and Mangsit beach. many hotels and resorts that offer budget accommodation ranging from simple to luxurious budget. The island is also has a fast boats service which has a direct access from Bali island. Mount Rinjani, Gili Bidara, Gili Lawang, Narmada, Mayura Park and Kuta are also a tourist destination that must be visited because those places presents interesting sight. Kuta Lombok is clearly different from Kuta beach in Bali, but this area is not as beautiful as the other one in Bali. There are so many other places then the mentions above are still beautiful, and unspoiled by tourists. Geographically, Lombok island has almost the same size as Bali, Lombok island itself located in the eastside of Bali. 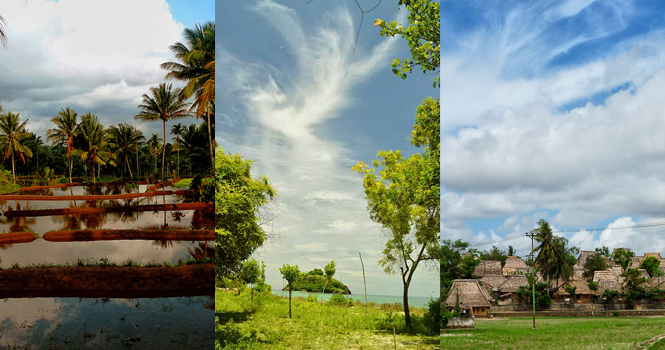 The island has a tropical climate with warm and humid weather throughout the year with a temperature range from 21 Celsius to 32 Celsius, the best time to visit is in May due to the rainy season starts from November to May and the dry season from May to October. if you come in May, then you will find the perfect weather with bright daylight and green scenery. Lombok is an island with a population about 2.5 million, the local inhabitants of Lombok called Sasak people. most of the inhabitants of the island of Lombok religions especially Islam sasak, Hindu is the second largest religion on the island embraced by the residents of Bali descent ranging from 15% of the population there, Christian, Buddhist and other religions can also be found, and especially embraced by the immigrants from various tribes and ethnicities who live on this island. Sasak people influence by animism, which most of them believe in the existence of spirits or ghosts, Sasak people usually assume that food and prayer is needed to be used to communicate with spirits, traditional magic practiced to ward off evil and illness. One of Sasak culture is visible at the Nyongkolan which is a series of wedding ceremony. Nyongkolan is a wedding party from the groom to the bride's house, which is usually accompanied by the beat of a traditional Sasak music, this process is usually done in the afternoon. Bau nyale is an events and traditions for sasak people, it is legendary and has a very high sacred value to sasak society. Bau nyale is catching sea worm activity in the south-central Lombok, which is also one of the most important festivals and popular in the island, Nyale is a sea worm which has a brown, red, pale green and cream colours. This activity usually takes place every year on the tenth month of the Sasak calendar with the full moon near future, these activities take place near from Kuta beach (Seger beach). Usually a week after the feast of Eid al-Fitr, Sasak people celebrate Eid Topat which is the end of the execution of fasting Sunnah Shawwal. people usually celebrate Eid with a visit the tombs or shrines after completion celebration held at the mosque. As for the tomb which is usually visited by the public at this time are: Makam Loang Balok, Makam batu layar which located in Senggigi beach area, not only the tomb filled with the visitors, but the society will also visit tourism places like the beach,park and many others. Perang Topat is one of the ancestral traditions and tribal sasak bali. where this war using ketupat as a tool for throwing, residents Lingsar districts, West Lombok, West Nusa Tenggara (NTB), especially the Moslem and Hindu continues to foster a brotherhood despite stretching the fabric of different beliefs, this is what triggered the war ritual execution Topat to realize fabric of brotherhood, where the show is held in the centered of the Lingsar temple. Besides Indonesian as the national language, the population of Lombok island (mainly Sasak), Sasak language as the primary language in everyday conversation. Across the Sasak language of Lombok itself can be found in four different dialects namely Lombok dialect of northern, central, northeast and southeast. In addition to the number of inhabitants who settled in Bali Lombok (mostly from the former kingdom of Karangasem), in some places, particularly in West Lombok and Mataram municipality of the township can be found using Bali language as the language in everyday conversation. Dendrobium calophylium (Anggrek epifit dan tumbuh tegak). A typical fauna in Lombok Island belongs to the type of Fauna transition, where the animals are mostly found in this area which is a kind of monkey and deer. Timor deer (Rusa timorensis) is a mammal native of West Nusa Tenggara are widely spread in the island of Lombok. The other typical of Fauna is Yellow-crested Cockatoo (Cacatua sulphurea parvula). This cockatoo inhabits primary and secondary forests and the high edge of the forest, monsoon forest also (Nusa Tenggara), high jungle bush. However, the population is threatened with extinction due to poaching by humans. if you go to Pusuk, it can be found habitat of Kera Gray (Macaca fascicularis) as the wildlife that inhabit these forests. These monkeys are very happy to be on the side of the road because they want to "disturb" so that visitors who come to feed them. GSM operators: XL (Excelcomindo) with its free card is that most users on the lombok island. Telkomsel, its second-largest on the island of Lombok. Indosat IM3 card and MENTARI is a mainstay for Internet users. (Three) and Axis. Operator CDMA : Flexi, Star-One, and Hepi. As well as the other areas in Indonesia, especially in Lombok there are also shops that sell various types of cards, and in this area it was very easy to find the various types of pulses Operator. So you do not have to worry about the smoothness of your communication with your family. The area code for Lombok area is 0370. The area code is used to make calls to Lombok from another province to either the cord or CDMA phone. In Lombok there are also many Wartel to make a call or send a fax. There are many cafe in lombok island, Especially in Senggigi and Mataram. vary speeds Connection from one place to another. In the â��â��Senggigi area speed connection is much better than in Mataram or anywhere else but a bit more expensive. However, the most expensive is in â��â��Gili Trawangan, Gili Meno and Gili Air area. Internet Rates in Mataram is between Rp. 3,500. - To Rp. 5,000. - Per hour. Internet Rates in Senggigi is Rp. 18,000. - Per hour / USD. 300. - Per minute. Another alternative way to get internet access is use a wireless connection. Now a lot of cafes, hotels and restaurants gives Hot Spot ranging from free to paid. 3G (UMTS) of operators such as XL and Telkomsel phone can also be on Lombok island, but only in â��â��Mataram and Senggigi area. Time operations of post office in Lombok: Monday to Saturday from 8 am to 2 pm except Friday, closing at 11 noon. The electricity supply in Lombok is 220 volts using two pin sockets and universal adaptors can be purchased in supermarkets and tourist shops. There is 24-hour electricity available on Gili Trawangan, Gili Meno and Gili Air but it is not uncommon for blackouts to occur there and in more remote areas on Lombok. Larger hotels often have backup generators. Some of the more remote Gilis in the South West do not have electricity and businesses and homes use their own portable generators. Ayam Taliwang, Ayam Taliwang is one of the most popular foods in Lombok. Chicken taliwang usually cooked with some options that are fried, grilled or baked. It would be more palatable if using young chicken. Taliwang chicken delicacy is also located in a super spicy marinade. Sate Bulayak, Sate bulayak is not only delicious but also a unique way of eating. Bulayak is a kind of rice cake wrapped in palm leaves or palm leaves with elongated shape like a spiral, so to have to open it in a circular motion. While the sate is made from beef seasoning greased typical Sasak. Nasi Balap Puyung, Nasi Balap Puyung is addictive foods. although it menu display is not too special but really spicy taste, makes you want again and again. This rice contains shredded chicken meat processed with chilli, soy beans, topping dried shrimp, shredded and fried eel. Ares, Ares is a typical vegetable in Lombok, the main ingredient derived from banana or banana young trees. Bebalung, Bebalung made â��â��from cow or buffalo ribs mixed with spice blend consisting of cayenne pepper, garlic, onion, ginger and turmeric plus ginger. Bebalung usually served in a bowl with a sprinkling of fried shallots. Beberuk terong, Beberuk terong is a kind of vegetables are foods that become friends taliwang chicken meal. In general, in tourist spots available alcoholic beverages, but because Lombok is predominantly Muslim island, some areas especially Praya prohibit alcohol service in the bar and restaurant. favorite drink is wine on the island, Red or White wine is fermented with the alcohol content of 2-5%. If you visit Lombok island, precisely in the tourist village of Pusuk with a Batu Layar districts, West Lombok, you will be able to enjoyed a traditional beverage of Lombok island. Drinks that are "tuaq". This drink, has health benefits as well as other uses. Beverages prepared from water the palm trees, the water is useful to facilitate large and small. Drink water that comes from the palm tree, if it is cooked to a temperature of 200 would be the brown sugar. Pusuk villagers feel grateful that they can produce their own way though, because the water treatment tuaq is not difficult. Iced Coffee Tongkat Ali, Once full enjoy typical dishes of Lombok, it never hurts to taste the freshness of drinks Lombok, this refreshing cold drinks and serving coffee freshness combined with ice. Tongkat ali iced coffee is different from the other. The difference lies in the properties of ice kopi tongkat ali can increase energy and vitality of men. So, this drink is well worth a try if you visit Lombok. There are so many thing that you can buy in Lombok such as pearl, Pottery, Handycraft, etc. Lombok is famous by its pearl. they grow pearl in the sea around lombok so its relatively cheap compare to other places. you can buy pearl in chunk or already create into a jewelry. the colors are varies from the traditional white until pink and black. the village that famous by its pearl is Sekarbele. There are several villages in Lombok dedicated to pottery. Banyumulek is the easiest to reach, it lies halfway between Lembar harbour and the capital Mataram. The pottery is of a terracotta kind, with tied rotan or painted decorations. The handicraft of Lombok is very popular, some are exported to other countries like Hongkong, Japan, and European countries. But we still can buy this in Lombok. If we buy clay pottery, then they will pack it in a box such a way, so we're not afraid of breaking it in the flight baggage. Lombok International Airport (BIL) is currently the only operational airport in Lombok. This airport is located in the town of Praya near from the highway in Tanak Awu South central of Lombok, and about 40km south of Mataram, 55km southeast of Tourism police station in Senggigi, west of Lombok. The DAMRI public bus provides scheduled services from Bandara Internasional Lombok to either Mataram or Senggigi. The buses serving the route have a capacity of up to 40 passengers, depending upon the bus used. The fare from/to Mataram’s Mandalika Bus Terminal is Rp 15,000 and from/to Senggigi it is Rp 25,000. A transfer at Mandalika Bus Terminal may possibly be required on some services. There are many fast boat operator that offer fast transfer from Bali to Lombok and Gili Trawangan. Fast boats depart from Bali via Sanur, Serangan and padangbay port. Landing in Lombok at Senggigi, Teluk Kodek and Teluk Nara Port. Private vehicles including cars, shuttle buses, buses and motorbikes may access the airport's public parking area and terminal drop off zones by entering through the main terminal gate. A timed parking fee is payable at the exit gate. This fee is payable by all vehicles entering the airport including taxi, cars and motorbikes, a time stamped ticket is provided at the entrance gate booth. if you're in Bali, then you want to go to lombok, you can use slow ferry from Bali desert that would normally take 4-5 hours journey to Lembar. in addition to regular ferry you can also use a large ferry which has minimal facilities onboard.